Regarded as the "Intelligent Garden City," Putrajaya will play host to the inaugural event on July 26, 2009. Ironman 70.3 Putrajaya will lead athletes on a scenic course in and around the new capital city, one that sits among lush landscaping. With a one-loop lake swim, a flat bike course and a picturesque run, participants will experience many of the area's historical attractions. Kuala Lumpur is close by, so there will be lots of attractions for both athletes and their families. 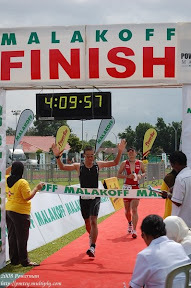 Four loops round the Putrajaya and finishing at the main entrance of the Putrajaya Square making up a distance of 21km.